Our friend Cacay made this fish salad when we had a get-together in their home recently. She announced that she was making a dish similar to kilawin (which is the Filipino version of the fish salad), but in this instance she will be followed a process done in the Pacific Island of Samoa. I am not a stranger to eating raw fish; I particularly love Kilawin, and also sushi and sashimi. So when Cacay mentioned that she was serving something different with raw fish, I got all excited indeed. 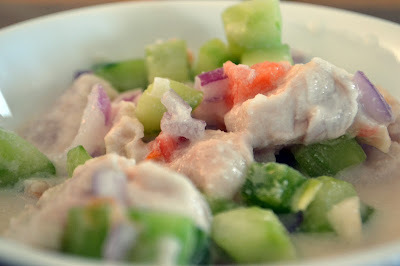 The taste of this fish salad is milder than the Kilawin I am accustomed to. I guess this is because the marinade - which is lemon juice - does not "cook" the fish as much. The nice thing about this though is that you get a better appreciation of the fish. So in this case, the fish must be as fresh as possible. The fish used in this recipe is Warehou, which the local fishmonger recommended as its flesh is firm and will not disintegrate if chopped into bite-size pieces. The amount or quantity of the rest of the ingredients will depend on the size of the fish. So basically, the chopped fish is marinated in lemon juice. Then chop some cucumber, onion, and tomatoes into small pieces. The fish will be ready by the time chopping has finished. Drain the fish of the lemon juice, then combine with the chopped cucumber, tomatoes and onion, and coconut milk for its sauce. Combine thoroughly, then sprinkle salt to taste. Refrigerate for half an hour before serving for the flavour to develop. The result will be a salad with some water in it (due to the veggies), which is fine. Just do a final mix before serving. Thanks Cacay for this recipe! I like it! It did make me think that this will go well with beer too.